MELKSHAM’S Person of the Year 2018 award has been won by Nathan and Kirsty Cortilla who own the White Hart pub in Atworth. Hundreds of votes were received in the competition, which was organised by Melksham News to find the person who has made a real contribution to the community in 2018. This year Nathan and Kirsty are celebrating 10 years behind the bar at the White Hart. Since taking over, the pub has become a community hub for the village and the couple have hosted a whole host of charity events, raising nearly £42,000 for local organisations, groups and charities. “We are humbled, overwhelmed,” Nathan and Kirtsy told Melksham News. “It was very unexpected. There were a great range of people nominated who do so many amazing things – so to have first been nominated and then win – it doesn’t feel real! Well done to everyone else who was nominated – everyone is a winner! 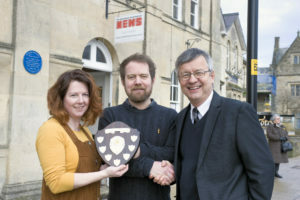 Ian Drew, editor of Melksham News, presented the winner’s shield to Nathan and Kirsty last week. Ian said, “Congratulations to Nathan and Kirsty for winning Melksham’s Person of the Year 2018. Nathan and Kirsty have made a huge contribution to Atworth in the 10 years they have running the White Hart, and they truly deserve to win this award. The messages we received from voters highlighted the huge impact they have had on the village, creating a community hub for everyone to enjoy. Other nominees were Kieran Baggs, Stevie Cooke, Luke Dark, Darren Gerrish, Ciaran Hanks, Kathy Iles, Luke Johnson, Sue Mortimer, Teresa Strange, and Adrienne Westbrook.